Home / Koi Breeding Project Plans / Its March! The calendar moved on one month last Sunday, and with it comes a step change in my preparations for this years breeding efforts. By the end of this month, I’d like to have both fry ponds relined and full and fertilised so they are fully cycled by early May like last year. The females have been overwintered in their pond at ambient temperatures, and have become more interested in food over the last month. I’ve been feeding a little bit each day and they are looking well. My two main kohaku females and all 3 shiro females are sporting promising bulges in the right places that suggest batches of eggs are available. It looks like my shintaro showa also has eggs and I’ll verify that when I examine them closer to the spawning week. I’ve installed another IP cam focussed on the females tank so I can keep a closer eye on them as they transition out of winter and into spring temperatures. The males are also looking well, and I’ve collected 4 new nissai from Yume Koi that Mike Snaden found for me on his Autumn 2014 trip. There are 2 omosako shiros and 2 takigawa kohakus. I wanted a surplus of males after last year’s males shortage. And they provide plenty of parent combination options in all 3 of the varieties I’m focussing on. I will move a few males on few once I’ve identified the best spawners. I always enjoy my trips to Yume, and his main display pond is something special. 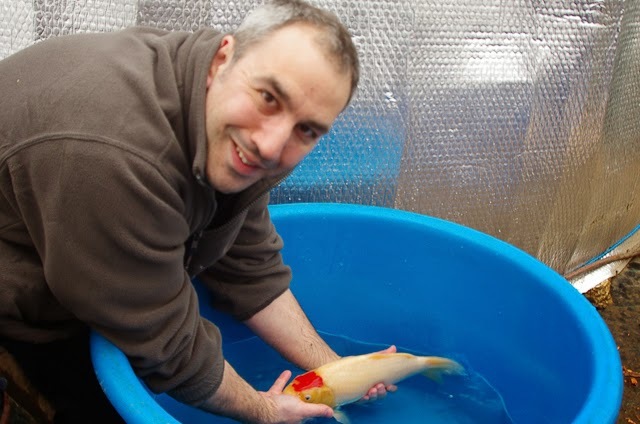 But what I particularly like is Mike’s thorough knowledge on each of the koi, their attributes and their genetic lines. We spent some time talking through a few of them which gave me some ideas for my own breeding project. The fish from Yume were in a heated tank so I’ve put them into my heated growing on tank with the May 14 spawning keepers. It gives me a chance to get them used to my water and also feed them up a bit – instead of waiting a few months and bringing them home closer to the spawning season. I place reliance on Mike’s quarantine process, and in addition to that I’m treating the tanks with salt, and when that’s diluted sufficiently I’ll give the tank a dose of MG & F too. NB: always avoid MG & F unless salinity is low – there are no hard and fast rules on how low, but I will only use MG&F if salinity is comfortably under 0.3%. The usual advice on treatments is to wait until the parasite has presented itself on skin scrapes before treating. But I’ve adjusted my approach around a year ago based on the stats from my own fish purchases – all from reputed koi dealers and koi farms – that around 50% of the time, I ended up with a parasite outbreak within 2 to 3 weeks after bringing a new fish home. So, I’ve adjusted my approach to give the fish a broad based treatment on entry to nip things in the bud. It does mean the fish are exposed to potentially more treatments, but on the flip side – based on the incidence of parasite outbreaks I experienced after bringing new fish home – the flip side is that the parasites are dealt with early and the parasite population doesn’t is pegged back early on and stays at a level where the koi don’t suffer too much from it. As with so many koi keeping decisions – it’s about choosing the right approach based on the context of your pond, the current state of the fish and filter, your available time and your own preferences on fish husbandry. The other koi happening last weekend was taking some more pictures for my forthcoming article in Koi Carp about the second year of my breeding project. I caught a few of my better tosai for the pics, and the largest one was tantalisingly close to 40cm….. just 0.5cm short! The harry potter tancho is starting to stand out and measured in at 38cm. Not sure about the skin though.... that will be a point of interest to track as this koi develops to nissai. I’m chuffed with the growth and the question now is how large will some of these fish grow to. The female is large but not jumbo (she’s mid 70’s cm and 5 or 6 summers old – I need to check.. ) ; the males are large for males – so my guess is that the maximum size my homebred kohaku will reach will be less than or up to the size of the female. The thing is, with a few pushing 40cm, and plenty in the 35cm – 40cm size bracket; those fish are clearly showing a propensity to grow – so how big will they get? - a new female kohaku. Ok, so here’s the thing – I didn’t expect to have tosai pushing 40cm at the end of Feb, but it’s happened. And breeding home bred koi that grow that well has been so enjoyable that I want to bolster my kohaku genetics with a female that’s got jumbo credentials, and comes from a line of jumbo making koi. Unfortunately, this may cost a few quid – I’ve asked Mike Snaden to investigate options on his next trip. - a new tank to grow nissai and sansei. I can’t do all 3. The Japan trip must happen. The female kohaku can only be funded if I move on some of my existing brood fish – and I’ve already shifted one, and have a few more that I am not going to breed from anymore and will sell those over the coming month. The new tank is the tough one. It’s so difficult to justify and may have to wait a year or two. We still don’t have an ornamental pond in the garden, and one option would be to build one and use that as the grow on for nissai and sansei – we have a spot picked out in the garden for it. And it would be awesome to have an ornamental pond and fill it solely with my home bred koi. How cool would that be!